It’s not often that children’s books and chronic pain cross paths, but that is exactly what has happened in Noah the Narwhal, a new book from author Judith Klausner and illustrator Sarah Gould. I was introduced to Judith by my old law school roommate, who was teaching a course at Boston University on anthropology and disability. She knew the author, who suffers from chronic migraines. “Does anyone have any media contacts in the chronic pain circuit?” Judith asked. Well, my roommate certainly knew someone. Me! Judith is a 31-year-old artist who lives in Somerville, Massachusetts, and this is her first book -- ever. You’d never know that by looking at it. The book is well written, slick, colorful and filled with friendly underwater characters who are brought to life in surprisingly little time. The story follows Noah, a narwhal whale who suffers from migraines (and who also wears a cute little sweater). I asked Judith why she chose narwhals. “Also, some people don’t think migraines are real,” Judith explained. “‘Eh, you have a headache. Get over it.’ I liked that analogy. Then, there’s the visual idea of the pain of a migraine. Noah wakes up with the feeling of a horn growing into his head. So that seems convenient! You just have to turn the horn inside out!” She laughed. Noah frets over leaving his friends and family in the lurch, but then they remember all the times that he was there when they needed him, and all the good that Noah has brought into their lives. They realize it doesn’t matter if Noah has to deal with migraines -- they love him, no matter what. In elementary school, Judith’s parents noticed a pattern and had the foresight to take her to a doctor when the migraines became more frequent and were accompanied by nausea. Eventually they were popping up multiple times a week, and auras started in high school. The migraines kept a very strict pattern, arriving promptly in the evening at 5 o’clock. They never showed up more than three days in a row, so the fourth day was always clear. Then, in college, everything went off the rails. With no daily schedule, her migraines had no schedule, either -- they decided to strike whenever they wanted, lasting days in a row. Her doctors tried her on preventatives, which caused a host of side effects. When asked how she dealt with college (she was a studio art major at Wesleyan College), Judith replied, “Not well.” She would let one class suffer each semester, in the hopes of just getting through with her degree. After graduating, she fell into a depression and her friendships withered, because chronic migraines (having one a day for almost three years) interfered with any work or social schedule. “That was a really important thing for me to hear, at a really important time for me to hear it. Someone gave me permission to stop beating myself up so much,” Judith recalled. Working from her couch, Judith put long hours into Noah the Narwhal, odds and ends that equaled a full-time job, though only when her body allowed. As those of us with chronic pain know, sometimes the demands of a full-time 9-5 job are impossible, a claim to which Judith can attest. For the artwork, she turned to her longtime friend, Sarah Gould. Their relationship goes back more than a decade. She works as a computer programmer on the west coast and earned a master’s degree in landscape architecture, but always wanted to work as an illustrator. The two of them thought that some sort of collaboration would be a fun long-distance project. Sarah’s soft, precious, approachable artwork is the perfect complement to Judith’s words. Even when she was writing, Judith said she was imagining Sarah’s illustrations. 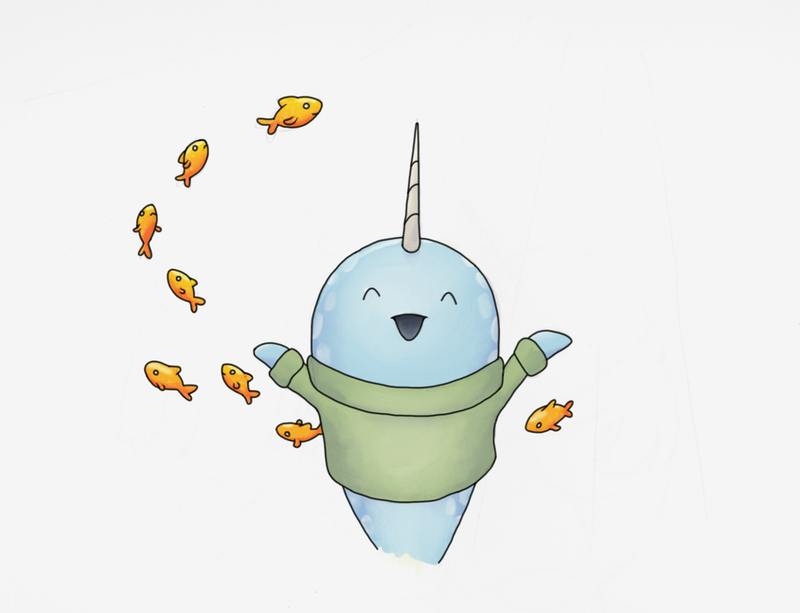 Noah the Narwhal works because it is a simple story distilled into even simpler parts. Pain isn’t complicated. Doctors, medications, lab visits, insurance bills and prognoses -- those are complicated. At its core, though, pain is a feeling, a reaction, a response to stimuli. It’s a horn drilling into your head. And it would do us all well to remember, today isn’t yesterday. Noah the Narwhal is featured on PNN"s Suggested Reading list.